Youropi is the site for city sightseeing. It's all about leisure and lifestyle focusing on active and dynamic consumers aged 25 and up. 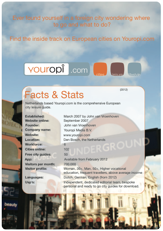 Youropi.com reaches over 700,000 unique visitors a month providing information on 102 cities for UK, Dutch, Belgian and German audiences. Consumers love Youropi's independent reviews and tips. An ad campaign or sponsorship with Youropi gives you direct access to a discerning demographic. Youropi.com offers several interesting ways to promote your product or service to your audience. We will provide a customised proposal for sponsorships, content integration or our special "City of the Month 'packages. Call our team at +3173 6230191 or email us. 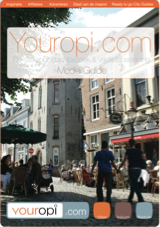 Youropi.com includes more than 50,000 points of interest and provides detailed information on traveling to and staying in a city. We specialise in providing city information which offers a unique opportunity to reach a highly targeted audience. The possibilities for this are clearly shown in the Media Guide. See our Fact sheet for prices. If you're interested in working with us send an e-mail or call us at +3173 6230191 for tailor-made advice.